I grew up in Arlington, Virginia. Both of my parents worked at the Library of Congress across the river in Washington DC. My father had a massive collection of books, mostly religious books, but a few interesting military history books. Visitors would always marvel about how our small apartment in Arlington could manage to hold so many books. Zillions of them! Books never had the same appeal to me as they did for my parents. Despite this, I still have managed to collect a library of books for at least one subject -- soaring. In my 30 years of soaring, I seem to have managed a small library that most of you have never heard about. I will share with you a review of each of these books in each monthly newsletter of Skylines. 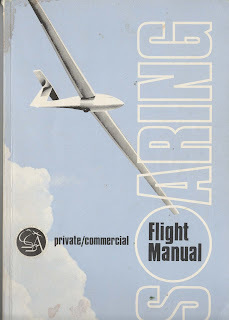 This month's book from my Soaring Library will be the first book that I have ever owned about soaring: The Soaring Flight Manual. I have owned two editions; one from 1984, and one from 1995. This book review will be from the 1995 edition. You can not find this book in stores, but you might be able to find a used copy on Amazon's used books. 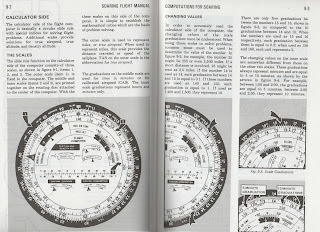 The final copy of the Soaring Flight Manual in 1995. Up until that date, this was the book that all of my flight instructors recommended that I purchase and study to prepare for the private pilot license. In 1986, that book was the standard for the knowledge required for the practical and knowledge tests. After the book finished its publishing run, it still continued to be the go-to reference manual for all that your Soaring Pilot in the US could need to know. 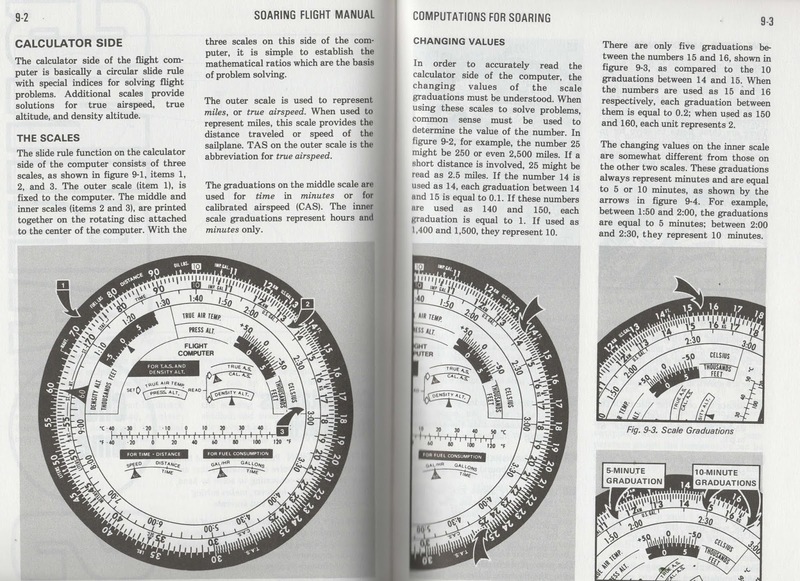 As the years went on, soaring pilots needing a soaring book found it increasingly difficult to get a copy of the Soaring Flight Manual. There were no more in stock! 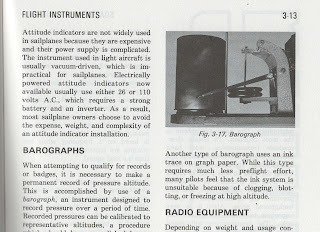 The FAA Glider Flying Handbook had not yet been published until 2003. For many aspects of soaring, this book has been left behind with the progress of soaring as a sport. 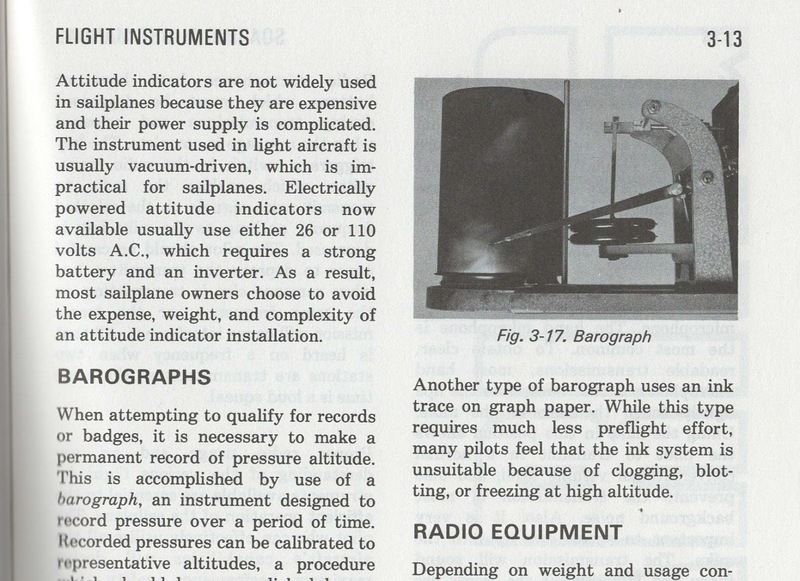 Throughout this book's pages you can find references to how to use a barograph (this is how we recorded altitude gains before GPS), how to use the original E6B flight computer (which is basically a slide rule for doing calculations in flight), and what a pilot must do when approaching TCA airspace (found in the 1984 version of the SFM). The graybeards of this club will find these subjects familiar and comforting. The rest of us might see it as a history lesson of how soaring used to be. Despite this book being out of print for more than 23 years, the FAA still references this book as the official reference material of the private pilot practical test standards. The FAA's practical test standards were also from the last century, having been last updated in 1999. If you are horrified about the antiquity of the standard to which we test our private pilots, rest assured that the FAA is updating all of the Practical Test Standards. The Practical Test Standards will be replaced and renamed as the Airmen Certification Standards (ACS). Private Pilot Airplane Single Engine land was the first rating to require the ACS. The FAA is creating a new ACS every few months. When the ACS for glider eventually gets published, it will probably reference the 2013 FAA Glider Flying Handbook instead of the Soaring Flight Manual. As long as we are not focusing on the technology of navigation or flight records, not much has changed in soaring. With regard to the stick and rudder aspect of soaring, those things haven't changed. The pictures in this book show the appropriate position on tow, with the tow plane's approximate position on the horizon. A side slip is still used for strong crosswinds. You still need to do a pre-flight inspection on your glider before taking off, and you still have to be careful about weather. Learn how to use an old school barograph for making badge flights in the 1980s and 1990s.